Paul Davis, social networking expert from Canada, will be visiting the area tomorrow. He will be leading a session for educators on how to step up our Twitter game. Everything from photos to hashtags to blogging and security settings. Here at Pleasant Valley, we’ve been an active group on Twitter the last few years and I’m anxious to learn what we need to do to continue to stay safe and protect our students. In my many conversations with students, I preach the importance of checking security and privacy settings on a regular basis. We talk that digital safety is an ongoing learning process. I need to practice what I preach and continue to hone my own toolkit. Please consider joining us tomorrow at Hopewell Elementary School at 3:45 to learn more about this critical topic. 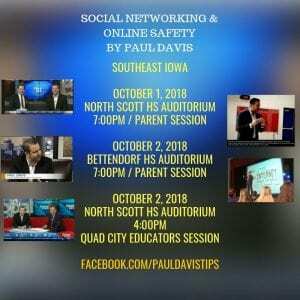 Mr. Davis will also have several evening presentations for parents at North Scott High School and Bettendorf High School. See attached flyers for additional information. I’ll update this blog post afterwards to include my new learning. At Pleasant Valley we take digital citizenship seriously. Our students and teachers in grades 3-6 spend multiple class periods at the beginning of the year discussing not only what is means to be a digital citizen, but how can we make our world a better place? We talk about a digital footprint and the permanency of our online behavior. Each grade level has a slightly different focus to build on the concepts from the year prior. And always, the emphasis is on the power of the conversation – both at home and at school. Families need to be discussing how to address privacy issues and the appropriate sharing of information, as well as how much screen time is healthy? Do devices really need to be in a child’s bedroom during the night? At school. our students even sign a contract to front load the expectations of responsibility, respect and doing the right thing. Actually, doing the right thing as a digital citizen, means we believe in the importance of contributing to make our world a better place. However, when I reflect on these digital citizenship lessons, I always wonder what is really changing? Are we making a difference? What behavior and safety issues are being addressed? What are our students going to actually do? Are students applying new learning to their daily life? So, we’re trying something new this year. At ISTE 2018, the hashtag of #DigCitCommit was introduced and we’re placing this challenge in front of our sixth graders. I’ve created a Padlet wall of ideas. On the virtual wall, students can join their classmates across the district by placing their name next to an idea they want to take on this school year. Everything from ‘Unplug from your device’ to ‘give someone who has messed up a second chance’ is on the Padlet wall. Students from all five elementary buildings may join in an idea with others, or come up their own plan. 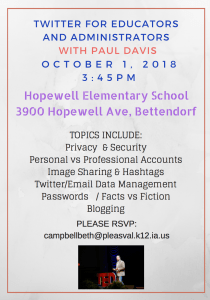 Some projects will be time consuming: podcasting on digital citizenship, hosting a parent event about online safety and mentoring younger students. Others have very little to do with computers, yet will impact interpersonal communication skills: writing a letter a month, playing outside more often and calling friends instead of texting them. Bottom line? I’m proud of these students and their willingness to take action. They are creative, innovative and caring young people. They do want to make a difference. Sometimes they just need a venue and some encouragement. I’ll be sharing more about their work during this school year. Wakelet – Jump on board! What defines life as rich and meaningful?